The chiansaw - the necessary tool, both in life, and at the dacha. It can be useful for cutting firewood for the fireplace, as well as for felling and branching. 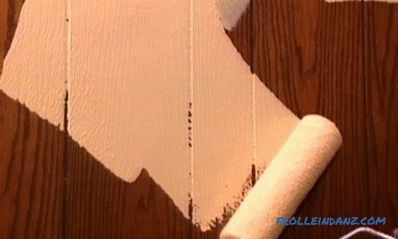 However, not everyone knows how to make a choice in terms of price and quality for the home and garden. On the brand of a manufacturer to stay, so that it serves for a long time and reliably. Today the range of tools of this kind is very wide. If before the choice was limited to "Friendship" and "Taiga", now products from Western manufacturers have appeared on the market. All chainsaws can be divided into three main categories. Household. Such tools are not very powerful, they are designed for work in the home. The tool can function no more than half an hour per day. The maximum is 40 minutes of continuous work. Monthly operated no more than 30 hours. If you load it more, it will very soon fail. 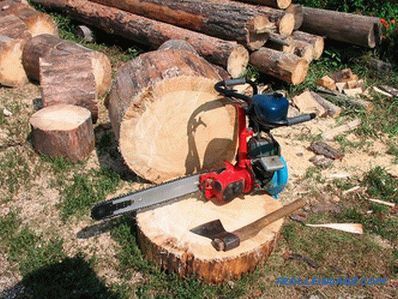 The main advantage of such a saw is lightness, compactness and convenience. Household saws are purchased in order to be able to cut some firewood in the fireplace or to repair the bushes. For serious work it is not intended. Semi-professional tools, somewhat more powerful than household ones. They can be used when felling trees, but mostly they are used in construction. At logging, they can be used for pruning. They combine power and relative lightness. They can work about 5 hours a day. Do not load them for a longer period. Chainsaws for felling. These are professional tools that can function up to 15-16 hours a day. Some instances are able to work longer. Such saws are distinguished by increased power. Of course, they are much heavier and more complex in design. 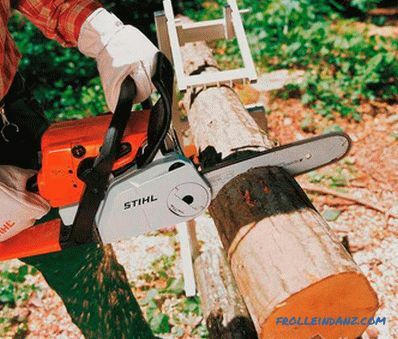 Before you decide Which chainsaw to choose, you need to think about where it will be applied. If we are talking only about small works in the garden area, such as trimming shrubs or cutting wood for the stove, then you can take a simple low-power saw. Work with this is implied for a very short period. On the day of such a saw should not be overloaded longer than half an hour. If, in addition to minor works on the site, construction or sawing of trees is also implied, then it is better to take a semi-professional unit. 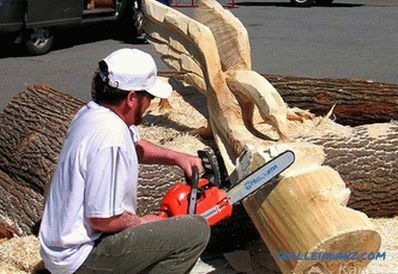 If long work is implied, then it is better to take a quality professional chainsaw. This is especially important if you plan to cut down large trees. The resource of such a tool is very large, which will allow to carry out work of high complexity. Today there are a lot of manufacturers on the market. The choice depends only on the wallet and the preferences of the buyer. Between price and quality is best to prefer the latter option. Chill chainsaws differ in numbers. So, the number 36 is ideal for felling, and for household work you can stay on the tool from the series 18-21. One of the most famous brands on the market is Sturm. 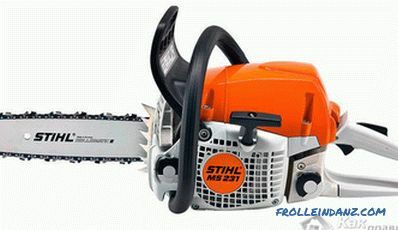 The company produces chainsaws of various capacities, which can be useful both in everyday life and when felling. A simple low-power saw of foreign production will cost 5-6 thousand. The average semi-professional will cost closer to 10 thousand. Therefore, before you choose a tool for giving, you will have to calculate your budget well. 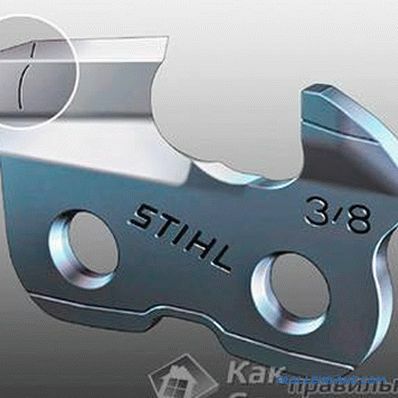 The advantage of the "Sturm" saws is that they are comfortable, safe and have good chains of wear-resistant materials. Working with such a tool is a pleasure. Analogue of "Sturm" - Swedish manufacturer of "Partner". It is cheaper, has almost the same characteristics as the competitor, but has a number of weak points. 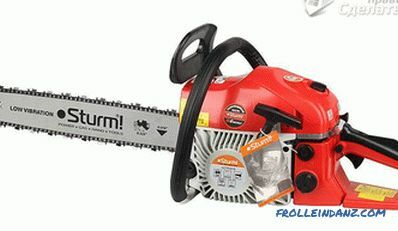 Thus, it is better to replace the chain of chainsaws with the Sturmovsk chain. Another weak point - the body of the saw. It can quickly melt if you do not clean the tool on time. The reason for this - too close location of the muffler to the body. 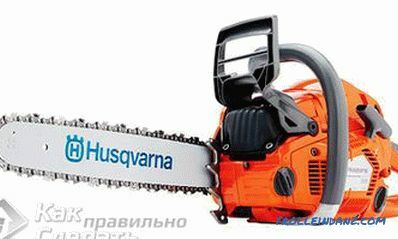 Husqvarna-357xp Another good option is a chainsaw from the Husqvarna line. These saws are of sufficient quality. For felling it is better to take the felling "Huskvarna". These saws also have numbers. For rolls, the number 357 will do. 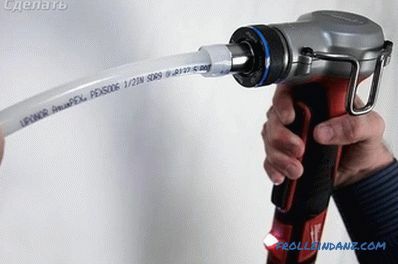 The cost of such a tool is in the range of 30-35 thousand. To make the right choice, you need to reconsider all possible options. 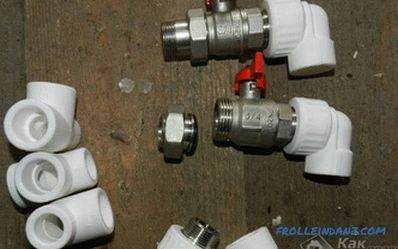 You also need to know the problems that often face the owners of gasoline tools. Headset incompatibility. Often the saw headset from one manufacturer does not fit the saws of another company at all. The only exception is the fact that the chain "Sturm" is perfect for Peel "Partner". But this is due to the fact that the company deliberately produces such details.In all other cases, acquiring a tool from one company will have to purchase a headset from the same manufacturer. Power orientation. Power is not everything in the tool. 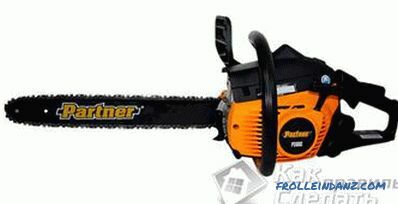 In fact, too high power chainsaws can make it extremely uncomfortable and even dangerous. Cutting speed. If the cutting speed of the saw has decreased, then it makes sense to pay attention to the sharpness of the chain. It depends on the quality of the tool. After a working day, the chain must be corrected, especially if we are talking about a professional tool that has been operated for 10-15 hours. Otherwise, the characteristics of the cut will fall, and very soon it will be impossible to work normally. Back kick. The return blow is the moment when the saw bounces sharply in the direction of the worker. It is dangerous and can cause death. Therefore, in order to prevent such consequences, there are two mechanisms. The first one is the brake on the handle. The second - special shields. Guards are not available in all saws. For example, tools made in Sweden are deprived. Therefore it is necessary to manage the first defense mechanism. It is very important to ensure that it is always in good condition. Anti-vibration protection. When buying a saw, you need to pay attention to the fact that the most modern anti-vibration system is installed there. Because the vibrations from the instrument can lead to serious diseases of the joints. 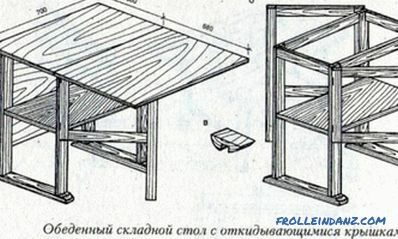 In addition, the work of a chainsaw, in which not very good "antivibration", is very difficult. Hands quickly get tired, and the work becomes overwhelming. Chain element Chains for saws are different. Therefore, we must choose them, focusing on the complexity of the work. So, simple low-profile chains are well suited for simple work in the country or at home. They have both advantages and disadvantages. Their plus is that such chains have a smooth course and almost do not create vibrations. This is because their pitch is only 0.325 inches. On powerful saws, chains have a pitch of about 0.404 inches. From the chain pitch depends on the performance of the tool. On low profile performance is small. In order to work under difficult conditions, as well as with complex materials, you will need a chain of highly durable materials. For example, for cutting wet or frozen wood, a conventional chain, even with high performance, will not work. Here you need a headset with tipped from hard alloy. By the way, when choosing powerful saws, you need to pay attention to the fact that their power has a very wide variation. It can vary from 2 to 5-6 kW. 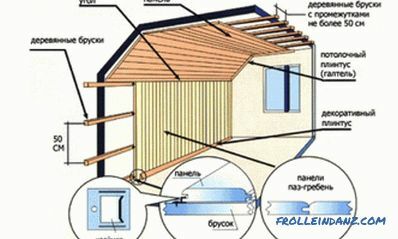 Therefore, it is necessary to approach the purchase, based on the complexity of the proposed work.